Many, after having responded to God's call to missionary service have struggled unsuccessfully to raise and maintain support. Friend Raising is essential reading for anybody involved in missions! Strong, godly relationships are the pillars of lasting support raising. Discover the friendship principles that are uniting thousands of missionaries and senders in their work for God's kingdom. "Friend raising brings together God's plan for biblical missions support with principles proven in the field. The book is a strong dose of common sense, mixed with that rare spice, respect for the donor, and liberally garnished with the conviction that God supplies needs through mutually satisfying relationships. In a world overwhelmed by fund-raising hype and gimmicks, Betty Barnett presents a refreshing biblical alternative." 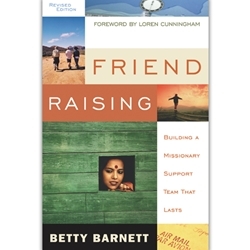 "In Friend Raising Betty Barnett has performed a significant service for all 'faith missions.' This is a valuable tool for anyone preparing to build a missionary support team." "Betty Barnett has lived out this book. Her teaching is not only practical but scriptural. Because it is scriptural, it will work in every part of the world, in all cultures." This is a "must read" for anyone contemplating missionary service.